Life with Lin-chan: Prize time: How to stay "cool"? Prize time: How to stay "cool"? Summer is around the corner, well it has already started in Japan. I want to know how you keep cool in the hot weather. Here in Japan they have lots of various ways to keep cool. Here is one way. Cool patches. 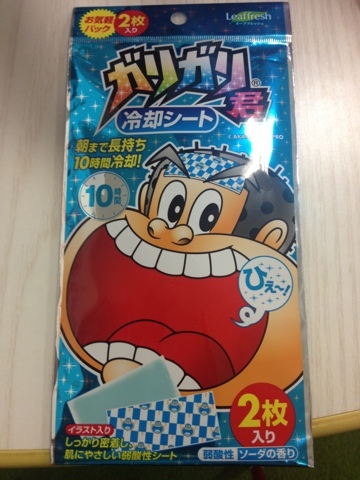 You can see in this picture of "Garigari kun" brand of cool patch that says can stay cool up for 10 hours with a smell of soda. Can be used at night on your forehead. Or on you arms or legs during the day. I wait until nighttime to cool down. I love summer because I can leave the windows open at night and enjoy a good night's rest with the night air. When Elizabeth and I were in Kamakura it was super hot, so we stopped by a small shop that sold shaved ice. It was my first time having condensed milk on shaved ice, and it was AMAZING! I miss it so much! On the hottest summer days I stay cool by floating in the ocean at the cottage with an icy cold Rockaberry cooler! !